It wouldn’t be Halloween without some data on the most and the least clicked-on advertisements for costumes. 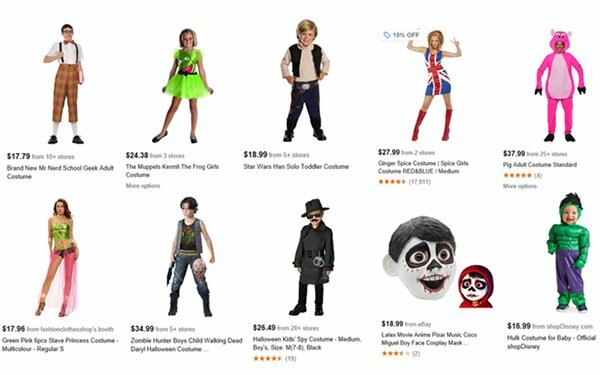 Some of the least popular costumes this year, as determined by paid-search click data from Kantar Media, include Nerd, Girls, Kermit the Frog, Baby Han Solo, Spice Girls, Men’s pig costume, slave princess, boys’ trench coat, child walking dead, Coco, and baby hulk. Disney’s characters seemed to lose favor this year. Minnie Mouse came in farther down the list at No. 14 and Maleficent at No. 16. To determine the least and the most popular costumes, Kantar Media examined U.S. desktop clicks on product listing ads for 2,988 costume keywords between October 1 and October 26, 2018. Wonder Woman and Batman were the most clicked-on costume ads. Superheroes and their archenemies were also popular. Spider Man came in at No. 6, Catwoman at No. 8, and Flash at No. 10. And the Joker came in at No. 19 to round out the top 20. Pennywise, the scary clown from the 2017 Stephen King movie, came in at No. 3. Unicorn at No. 4, pirate at No. 5, and Moana at No. 7 are some of the other costumes in the top 10 ranking. Among advertisers, HalloweenCostumes.com ranked in the top product listing from October 1 through October 26, with 17.4% of product listing ads click share on the keyword group “costume.” The online specialty retailer also ranked second in text ad clicks with 14% click share. Party City ranked No. 2 in PLA clicks with a 14.7% click share, while also ranking No. 7 in text ad clicks with a 3.1% click share. Spirit Halloween ranked No.3 in both PLAs and text ads, generating an 8.3% PLA click share and an 11.5% text ad click share.